TAMU oceanographers research the effects of Harvey to learn about severe environmental changes. The first major hurricane to make landfall on the United States mainland since 2005, Hurricane Harvey was a disaster: killing tens, displacing millions and causing billions of dollars in property damage. Such fast, severe environmental alterations also leave behind conditions that need to be studied. Harvey’s quick escalation gave Texans little time to prepare: at 10 a.m. on August 23, the weather system had “no sustained winds of Tropical Storm Force;” forty-eight hours later, Harvey was a Category 2 hurricane and strengthening. That night, Harvey made landfall as a Category 4 storm with winds of 130 mph, causing storm surges in excess of six feet. Four technicians with the Texas A&M Department of Oceanography affiliated Geochemical and Environmental Research Group (GERG) were caught out on the Gulf of Mexico repairing buoys that provide oceanographic data. Now, the department hopes to learn from the hurricane, thanks to recent funding from the federal government. The National Science Foundation issued a Dear Collegues letter on Sept. 1 requesting proposals “focusing on projects with severe urgency” to “address the challenges related to this storm.” Numerous professors in the Department of Oceanography responded, three proposals were funded, and the work has already begun. Dr. Tony Knap, Dr. Steve DiMarco, Dr. Henry Potter, Dr. Kathryn Shamberger and Dr. Piers Chapman were awarded a grant for their proposal "The impact of increased fresh water input from Hurricane Harvey to the water quality and stratification of coastal and offshore waters of Texas." The team will take two research cruises to study the extent of the freshwater plume coming out of Galveston Bay, Corpus Christi Bay and rivers such as the Brazos, taking real-time data onboard the ship as well as water samples for further lab analysis. They will be keeping a close eye out for hypoxia, which is caused by too little oxygen dissolved in the water, a common late-summer phenomenon in the area that may be exacerbated by the surface freshwater’s inability to mix with deeper water. Dr. Kristen Thyng and Dr. Scott Socolofsky were awarded funding for their proposal “Measuring freshwater exports from Galveston Bay after Hurricane Harvey.” They, with GERG postdoctoral researcher Dr. Kerri Whilden, will be sampling the freshwater plume coming out of Galveston Bay to better understand the complex and previously unstudied dynamics when such a huge pulse of freshwater enters the bay and then the shelf. They will be collaborating with Dr. Rob Hetland (TAMU) and Dr. Ben Hodges (UT). The team has extensive experience modeling, and hopes that their findings calibrate and validate current and future models. According to the proposal, they are excited to study Galveston Bay as it recovers from Harvey’s extreme freshwater input and returns to its normal semi-salty state. 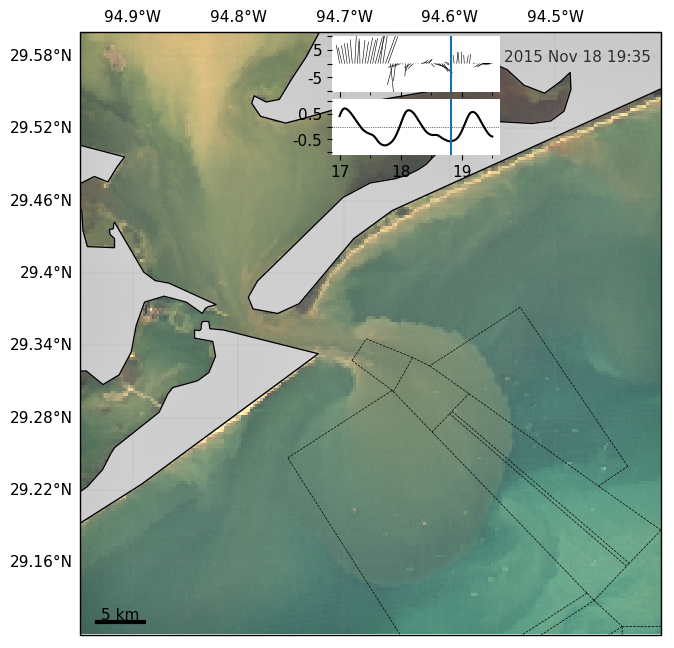 The Campbell Lab, led by Dr. Lisa Campbell, has been awarded a grant for their proposal “Hurricane Impact on Phytoplankton Community Dynamics and Metabolic Response.” The lab already has an Imaging FlowCytobot that collects automated continuous time series data of phytoplankton abundance at Surfside Beach on the Texas Coast. This data will be combined with metatransciptomics, or molecular information on the genes that have been expressed, to provide insights on the environmental factors and metabolic responses structuring the phytoplanktonic community during the aftermath of the hurricane. The researchers said that while it is feared that the frequency of extreme storms will increase with future climate change, experts hope that the responses identified by this research will be valuable in predicting how such events will affect primary production – the basis of most food webs in the ocean. The lead investigators of the three projects have coordinated ship time on the RV Point Sur from Sept. 22 to Oct. 1, and they are now out in the coastal waters of Texas where this research is taking place. The freshwater plume from Gavleston Bay. Black lines depict the shipping channel. Top data are wind and tide data. Image credit: Dr. Kristen Thyng.